Monsters have surprising things in common. Ghosts are, perhaps, the only true universal monster... the only one believed of worldwide. A ghost is said to be the spirit of a dead person or animal which has returned to the world of the living in a disembodied form. Beyond this, ghosts can be different from country to country, person to person. Sometimes a figure of a person is seen, hazy or distinct; sometimes a voice is heard, or a presence felt; sometimes a ghost is even something as simple as a scent that shouldn’t be there, but is known to be associated with a departed person. Many ghosts appear only once, to just one or two people. These brief visits usually have a distinct purpose behind them, as if to say that those who have departed cannot truly rest until one last job is taken care of. 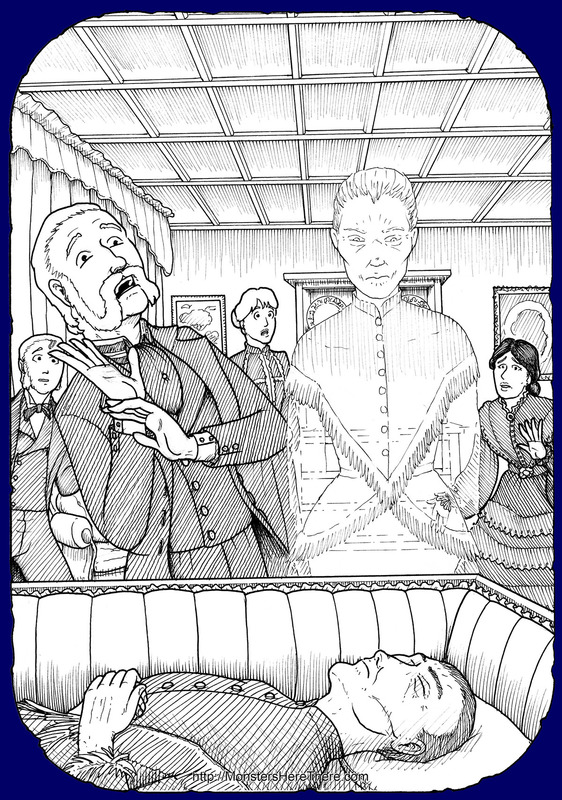 Some ghosts return to ask for help in finishing a task that has prevented them from resting; and once this task has been dealt with, the ghost in question stops appearing. Some ghosts only appear once as a notifier of the person’s death to their loved ones, generally appearing shortly before or after the dying person has finally passed on... this has been reported so much, in fact, that this phenomena has been given a name, and it's own listing in MH&T: "Death Wraiths." Some ghosts don’t go away; instead, they continue to visit places they either knew in life, or became associated with through death. When a location is regularly visited by activity that is believed to be caused by ghosts, that place is said to be “haunted.” Some hauntings are quiet and benign; the ghost makes a few noises or sometimes moves things, but does nothing that really bothers the people living or working near it. Some hauntings are impossible to live or work near. Sites of such hauntings can become a battleground between living people who currently own a property and the ghosts of the dead who see the living as invaders into their chosen residence. A bad haunting can drive people away, or even destroy the structure. Beyond being dangerous or not, people who have studied hauntings have also noticed that some ghosts seem intelligent and interact with their surroundings, while other ghosts seem to ignore everything and repeat their actions again and again. this has led to a theory that while some ghosts are in fact the spirit of a previous living person, that other "ghosts" are actually some sort of phenomena that somehow recorded an event of the past and now continues to re-play this event from time to time. While this second phenomena would look like a person or ghost in action, they would be no more responsive to their environment than characters in a movie are. Below are various accounts of ghosts from all over the world and different periods of time! Phantasms of the Living: Vol. I, by Edmund Gurney, Frederick W. H. Myers, & Frank Podmore, 1886 London, England. Online: Click Here! Apparitions and Thought-Transference: An Examination of the Evidence for Telepathy, by Frank Podmore, 1895 London, England. Online: Click Here! True Ghost Stories, by Hereward Carrington, 1915 The J.S. Ogilvie Publishing Company, New York, USA. pg. 164-169. Online: Click Here!